When they feel a Bond film may have gone too far into the realms of fantasy, 007 fans often suggest things need to go back to basics; return to the style and feel of the original books by Ian Fleming. 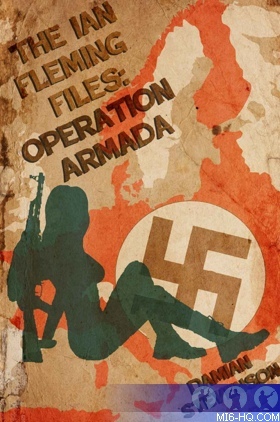 In something of a twist then, Damian Stevenson's book "The Ian Fleming Files: Operation Armada" performs a role-reversal - applying the real-life Bond creator's role as a British Naval Intelligence officer during the Second World War to a novel in the style of his own creation. It's a gamble that could go horribly wrong, of course (how exciting, daring and courageous Fleming's exploits were back then is open to question, let alone whether he was actually engaged in any fieldwork), yet Stevenson pulls it off because, like Fleming - or Bond for that matter - during a game of their favoured baccarat or vingt-et-un, he doesn't overplay his hand. Proceedings begin in spring 1940 and the war's warming up, with France having just been overrun by those nasty Nazis, yet not for our hero-to-be Fleming, who's stuck in a dull Whitehall desk job. His discovery then that the cream of the French Navy (gigantic battleships among it) is about to be half-inched by the Germans offers him not only a chance to impress his boss with a pressing mission, but also the opportunity to get out of an air-raid-afflicted London and see some action himself in Continental Europe. The "Ian Fleming Files: Operation Armada" pretty much crosses all the 't's and dots all the 'i's of the Bond novel formula. There's lashings and lashings of action; lots of sartorial detail (the author, as was Fleming the writer, seems a genuine enthusiast of military uniform and tailoring) and hardware description (the amount of weaponry and vehicles is dizzying); torturing of the hero (Fleming undergoes an interrogation just as vicious as any Bond's undergone) and despicable villains and beautiful women (although real-life figures, France's Admiral Darlan and Germany's General Bock are adapted to effective Fleming-esque Euro maniacal baddies, while the hero's main squeeze appears inspired by famous British double agent Violette Szabo). If anything, though, this novel from Hollywood insider Stevenson maybe suffers from laying things on a little thick. While it admirably gives characters time and space to breathe as we get to know them, as soon as Fleming and his French Resistance cohorts get stuck in, the pace becomes breathless; each action set-piece is layered on top of the last and villains make observations of the hero like 'the man who can dominate a London dinner party can dominate the world'. It's all tongue-in-cheek, for sure; the unremitting action reminiscent of the Brosnan Bonds and the jackbooted Nazi villainy of Indiana Jones. More Devil May Care than Dr No perhaps then, but lots of fun, no question. There's also knowing nods to the Bond universe, including M (his office and Miss Moneypenny included) and specifically the films From Russia With Love, Goldfinger, The Spy Who Loved Me and GoldenEye. Moreover, fiendish Q-like devices make appearances and there's stand-out moments like a pursuing Nazi skier being skewered to death by a falling stalactite and a safe whose door hidden as a dartboard is opened by the thrower hitting the bullseye. Quite what Fleming would make of this novel is anyone's guess, but then, as his fictionalised self here's just as cool a customer and just as effective and destructive as his own creation (that is, he's as much an aspirational, male-fantasy-figure as 007), he'd probably love it. Many thanks to Adam Bollard.